A star vehicle for Robert Redford, but the star is disinterested and the vehicle badly needs a tune-up. With Redford going through the motions, Gene Hackman as the US national ski team coach is the liveliest thing in Downhill Racer, but he need not work too hard for that distinction. 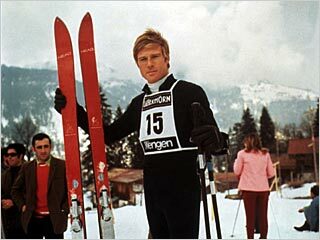 Redford, as the cocky newcomer with raw skiing speed bursting onto the team, maintains a single expressionless expression throughout the film; which is one expression more than the rest of the cast. His teammates on the ski team are interchangeably faceless. The love interest (Camilla Sparv) emerges from nowhere and disappears almost as quickly playing the required icy but unknown late-1960s blonde willing to get a bit naked in return for sharing screen time with a star. And if there are any other characters in Downhill Racer, they are hidden behind enough ski racing gear not to matter. Michael Ritchie briefly earned a spot among the elite up-and-coming young directors of Hollywood, using a newsreel style to tell the shallow and unlikely tale of Redford's rapid rise from obscurity to Olympic glory. The film today is only notable for the skiing scenes; Ritchie's subsequent body of work proving that the banal interludes in-between the racing were more indicative of his talent. The skiers may be racing downhill, but the film is going nowhere fast. All Ace Black Movie Reviews are here.